Background: Despite the availability of a variety of antibacterial agents, re-emergence of pathogenic bacteria is still a serious medical concern. So, identification of new, safer, and selective antibacterial agents is the key interest in the medicinal chemistry research. Method: To explore the antimicrobial activity of coumarin-3-carboxamides for a range of bacterial and fungal strains, twenty eight derivatives were synthesized by the reaction of coumarin-3-carboxylic acid with a variety of aniline derivatives in the presence of 1,1'-carbonyldiimidazole (CDI). All compounds were structurally characterized by different spectroscopic techniques EI-MS, HREI-MS, 1H-NMR, 13C-NMR, and evaluated for antimicrobial activities (antibacterial and antifungal). Results: A number of compounds showed good to weak antibacterial activity against various strains of Gram-positive and Gram-negative bacteria. Amongst them, compound 28 displayed noticeable inhibition against five strains of Gram-positive (Bacillus subtilis, Corynebacterium xerosis, Staphylococcus aureus, Streptococcus faecalis, and MRSA) and four strains of Gram-negative bacteria (Klebsiella pneumoniae, Pseudomonas aeruginosa, Enterobacter aerogene, and Shigella dysenteria). However, none of the compounds showed antifungal activity against tested fungi. MIC values were determined for most of the active compounds 2, 15, and 28 against particular bacterial cultures. 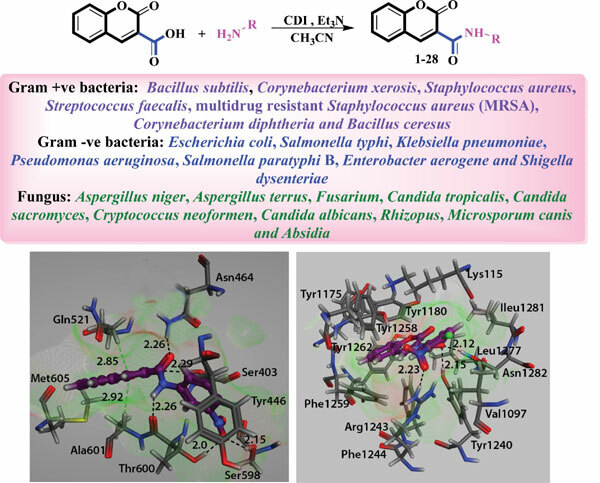 In silico studies were performed on the most active compound 28 in order to specify and verify the target for antibacterial activity of synthetic coumarin-3-carboxamide derivatives. The cytotoxicity of these compounds on mammalian cells is unknown yet but we are planning to carry out research on the cytotoxic aspect of these compounds in future. Conclusion: The newly identified compounds may serve as lead molecules for the future research regarding the identification of new antibacterial agents. Antibacterial, antifungal, coumarin-3-carboxamide, 1, 1'-carbonyldiimidazole (CDI), in silico studies, synthesis.